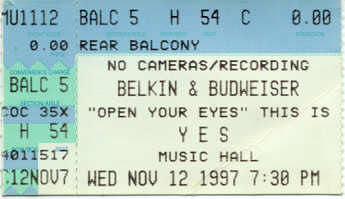 The band was very relaxed, even after something fell (I think it was a spotlight lens) very near Steve Howe. He had to stop playing for a while. Chris Squire seems to be getting younger, at least by the way he's jumping around and having fun. Jon explained a little about writing "Soon" before a nice rendition of it. It was a nice evening, but no surprises. My brother and I went to the Cleveland show last night. 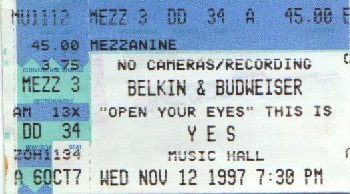 Our Yesworld seats were 3rd row in front of Steve Howe. Jon's wife (and one of the other wives) sat in the row ahead on the aisle. The show was great, and Music Hall was packed. A light exploded above Steve, hitting him with pieces of the lens and bulb in the middle of one of the first songs (I forget which one). During the start of Owner of a Lonely Heart, Jon cracked up a little when he sang "Move yourself" and two people from the front row stood up and went to the restroom. Heard Children of the Light for the first time. I like it. There weren't many morons sitting around screaming things out where I sat. There were some further back, but they weren't too distracting. No one had to be told to shut up. The most annoying thing was the people with baby bladders that had to make four trips to the restroom during the show.